NB: I know, I promised today’s post would be the second part of my Attack on Titan review. Unfortunately, past-Adam decided to write about anime on Monday. Rather than drive away all of my non-anime traffic this week, I thought it best to turn my attention to zombies instead. Because who doesn’t like zombies? I find myself conflicted as I ponder exactly what words I will devote to World War Z. On the one hand, it would be easy to systematically eviscerate this movie as one of the worst big money making failures I have ever seen. However, such a lengthy deconstruction would probably occupy my time and yours, dear reader, more than this movie deserves. In fact, if ever there is a movie whose short-comings are so profound and so striking as to merit nothing more than a hundred well placed words of warning and scorn, then surely it is World War Z. Be that as it may, we’re in this together, so I’ll attempt to make this review a meaningful exercise for all parties involved. 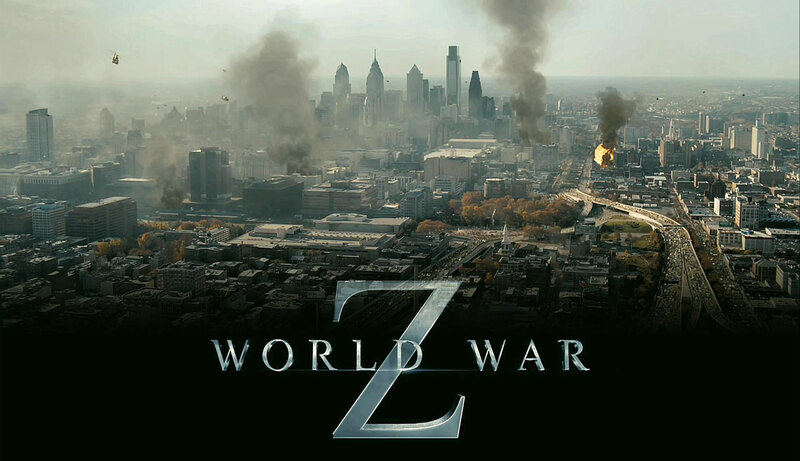 In short, World War Z is a perfect example of a movie where the brand is more important than the story. Max Brooks’ seminal zombie anthology is all but required reading for genre enthusiasts and scholars of the same. Yet the book’s nature as a collection of related short stories (think along the lines of Asimov’s first Foundation novel) runs counter to the three-act structure that governs most Hollywood claptrap. So what is a movie producer to do when they have a money making property, but no easy point of entry into the formula that makes the book a financial winner? In retrospect, and fully acknowledging my role as an armchair quarterback, the smart option would have been to do anything other than what they did. Without getting bogged down in the quagmire of book versus movie, it’s safe to generalize the book as a political and sociological entity. Pick an issue that made headlines between 1999 and 2005, and you’ll likely find it its horror analogue in the pages of World War Z. The ultimate failing of the movie is the dark, empty void where the political and/or sociological narratives are supposed to live. Instead, the audience is presented with the much more tiresome story of a father who “just wants to get back to his family” i.e. every other movie where a male character has to save the day. Brad Pitt plays Brad Pitt Gerry Lane, an all American super-dad, whose experience upholding the white man’s burden in failed African nations makes him well equipped to trace the epidemiology of a viral outbreak. It’s funny how I much preferred this movie when it was called Contagion, and featured a cast of brilliant actors playing smart people, rather than a bunch of cut rate actors (as to offset Brad Pitt’s payday of…sweet salty Jesus…14 million dollars) and Peter Capaldi playing morbidly stupid people. It’s also striking how I found myself ninety minutes into World War Z before it lumbered into a third act that hadn’t been given away in the trailers. Literally, every major plot point of the first two acts are blown in the promotional material. Normally, I’m not one to whinge about knowing the plot of something before I see it, but in the case of World War Z there’s nothing else going on other than plot. It’s literally Brad Pitt running from zombies and zombies chasing Brad Pitt for two hours. The death of the “smartest person in the world” within the first act pretty much makes clear that this isn’t going to be a thinking person’s zombie movie. 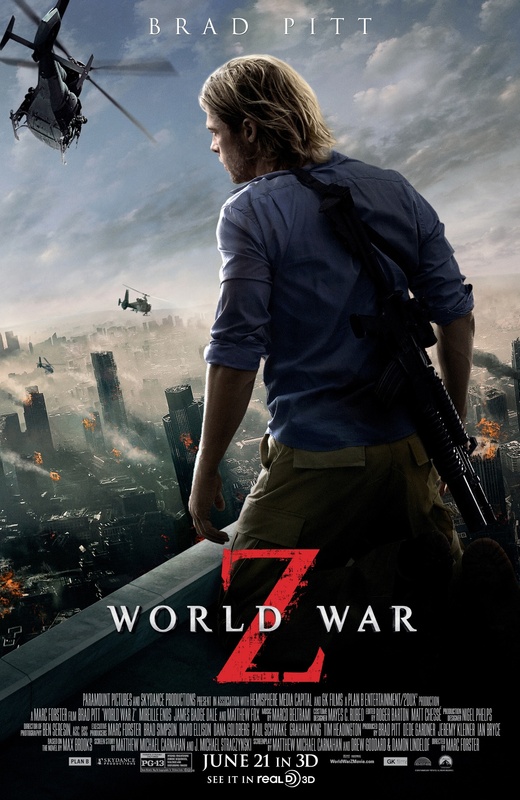 Quite frankly, I’m not sold on World War Z as an idiot’s zombie movie. It’s just a thing that desperately wanted to be made because the branding was there. The real tragedy of World War Z is seeing J. Michael Straczynski’s name in the writing credits but subordinate to Damon Lindelof and his fellow Lost writer Drew Goddard. How many of Straczynski’s good ideas were excised from the script in favour of Lindelof’s blather, which effortlessly strides the boundary between mass market appeal and complete garbage. Make no mistake, this is a movie that fails on its writing. The cast is capable. The imagery and camera work are adequate to the task at hand. Only the story is an unforgivable waste of time, thus informing and simultaneously condemning every other aspect of this movie. It’s just that simple. World War Z is a turd, a lame duck, and a movie that makes me think Prometheus isn’t quite as bad as I remember. If you haven’t seen this travesty, I suggest calling up a few friends and having them engage you in a game of “chase and pile-on.” Not only will you get some exercise, but you will have lived through about 80% of what this movie does with its two hours. To everybody else, I’m sorry. I’m so sorry.